The Samsung smartthings home monitoring kit lets you easily control and monitor your home from anywhere in the world. 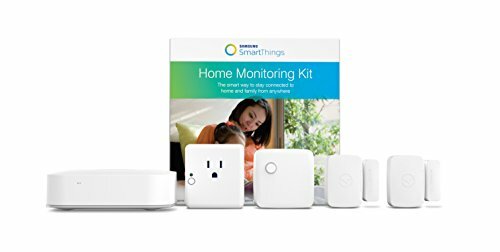 The kit includes a Samsung smartthings hub, two Samsung smartthings multipurpose sensors, one Samsung smartthings motion sensor and one Samsung smartthings outlet. You can monitor your home to protect your family and property; automate lights and electronics; and create a safer, more efficient home that is set to your unique preferences. You can even keep an eye on things when you pair a compatible camera with your video-ready Samsung smartthings hub. Samsung smartthings offers a one-year limited warranty.